Four of Tom Cat's most popular dinner rolls, Brioche Pull Apart Roll with Onion and Poppy, Seven Grain Mini Round Roll, Black Raisin Round Roll and White Long Roll. 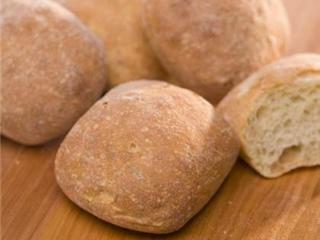 French, Seeded French, Rustic and Whole Wheat Dinner Rolls. 96 per case - 1.8 oz. 225 per case, 1.5 oz. Tom Cat's lightly sweet brioche dough in a pullapart roll topped with Cabot Extra Sharp Vermont Cheddar Cheese. These savory and buttery rolls come baked together 6 across, unsplit. Perfect for one-bite appetizers, tapas and small plates. Approximately 2 inch. Challah Burger Buns have a glossy crust and a sweet, moist crumbperfect for veggie, chicken, tuna or beef burgers. 60 per case - 2.5 oz. 60 per case, 3 oz. 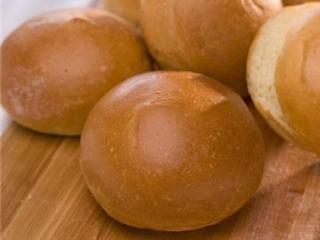 A light and fluffy interior with a crispy crust makes these rolls perfect for pressed sandwiches. 1.7 oz. each and ready to bake in oven safe packaging. Contains Campo, Kings, and Marble Rye. The crust of this French Roll is so fine it crackles when you break it open to reveal a delicate bubbly interior. 180 per case - 1.3 oz. These petite pull aparts are made with Tribeca's signature French dough to create up to 10 shareable rolls or mini sandwich carriers. 12 per case, 6.2 oz. A memorable bun! Perfect for a new twist for a hamburger. Light and airy with a great pretzel taste. A blend of marjoram, thyme and sage lend a light flavor and complex fragrance. Durum and wheat flours and extra virgin olive oil give this Stirato Square a thinner crust and a light, tender texture.